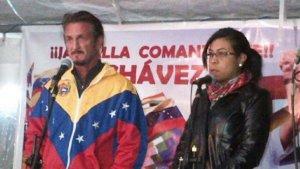 BUENOS AIRES -- Actor Sean Penn made a surprise appearance Monday in Bolivia as he attended a candlelight vigil for the health of Venezuelan President Hugo Chavez, who is in Cuba undergoing his fourth cancer surgery. The event attracted Chavez supporters as well as Bolivian officials and took place in a diplomatic location in La Paz. Penn joined Venezuelan ambassador Crisbeylee Gonzalez and took the stage wearing a Venezuelan flag jacket, according to a report by EFE. “Thank you, Sean,” said Gonzalez, “for joining us and for wanting to be here. We know President Chavez is a good friend of yours, and you didn’t hesitate one second about coming here with us to this vigil." Said Penn: “He’s one of the most important forces we’ve had on this planet, and I’ll wish him nothing but that great strength he has shown over and over again. I do it in love, and I do it in gratitude. Penn has openly expressed his admiration and support for the left-wing government of Venezuela in the past and declared that U.S. audiences have been “hypnotized” by big media corporations regarding Chavez’s democratic credentials. “Who do you know here who's gone through 14 of the most transparent elections on the globe and has been elected democratically, as Hugo Chavez?" he stated in 2010. Since then, Chavez has won yet another presidential election this year against opposition candidate Henrique Capriles. Penn was in Bolivia this week to attend a hearing for the release of businessman Jacob Ostreicher, who has spent 18 months in a maximum-security local prison with no trial or sentence on charges of money laundering.